The City of Nacogdoches Main Street program is excited to announce tickets for the seventh annual Wine Swirl are on sale now! The event is 5 - 9 pm on Saturday, February 9, 2019. 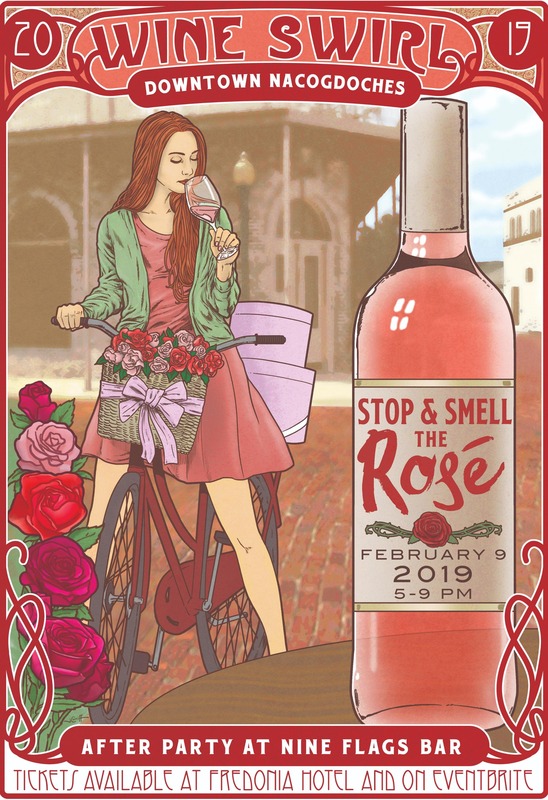 The ticketed wine event will showcase Texas wineries and local and regional food trucks along the historic brick streets. Proceeds will be used to enhance the beautification and promotion efforts of historic downtown Nacogdoches. Wineries will be stationed outside of Downtown shops in booths -- like a Wine festival! Your ticket includes access to the event gate, a wine glass for sampling and purchasing wine, and a commemorative bag for holding wine bottles. You will be able to purchase glasses and bottles and drink them in the street at the event while you shop. Attendees will have the opportunity to enjoy wine samples from Texas wineries - but you are encouraged to purchase a glass of something you love! Food will be available for purchase from several local and regional food trucks and downtown restaurants. You must pick up your Swirl packet, including your event map, wine bag, glass, and wine passport the evening of the event at 200 N. Fredonia. You may also pick up your packet early on Friday, February 8 from 4:00- 6:00 pm or the day of the event from 3 - 6 pm. Remember, Main Street will be closed on the day of the event so plan accordingly. You may contact Amy Mehaffey at 936-559-2573 if you have any questions. Whether in-town or out-of-town, we hope you will take the elevator home at our host hotel, the Fredonia Hotel and Convention Center, for the entire weekend. To contact the Fredonia Hotel, please call (936) 564-1234 or click here to book!